a warm welcome for the yachts that stray through the area on their East to West treks. That's it. 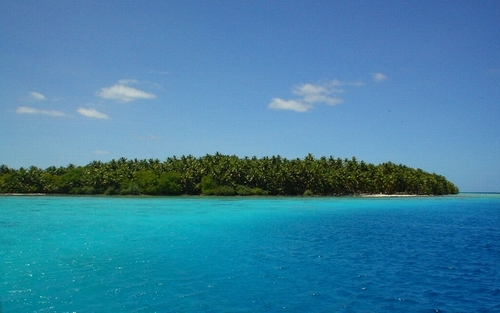 Othewise it's just peace and quiet in a perfect harmonious South Pacific atoll. 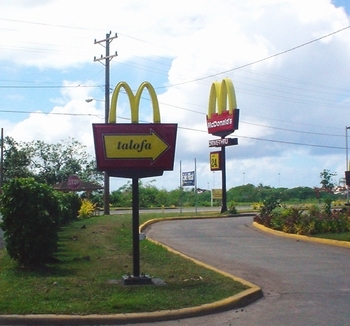 but Jack was in a hurry to pick up mail in Pago Pago. Baker seems to fall in love with a lot of the female visitors. Chrissi and Baker dancing at the dinner party. 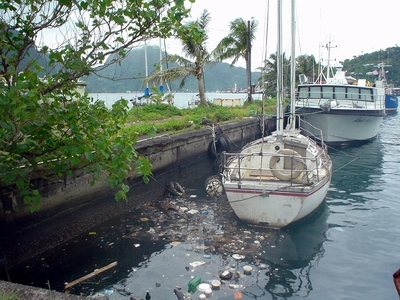 broken dream embodied in this neglected boat - was adjacent to Pago Pago's "Customs Dock" for arriving yachts. 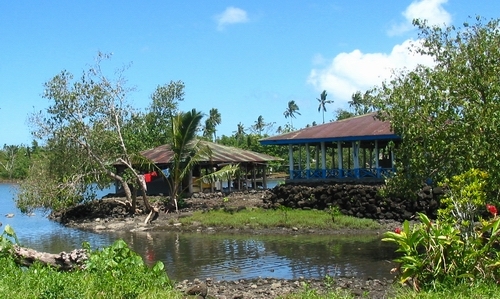 It's an accurate image of the neglected public infrastructure and the absence of public spirit in American Samoa. The most dense accumulation of plastic bags ever seen anywhere in any harbor. A crumbling infrastructure that seems to say, "Screw you. Take care of your own welfare or well-being." A hospital that hasn't funds enough for even a store of normal medicines ("we don't care"). Ubiquitous yellow ribbons along every meter of roadway proclaiming support for "our boys,"
boys who were among the very first to be sent to Iraq as cannon fodder in that American adventure. 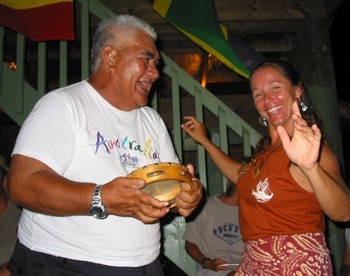 American Samoa gave me (Jack) the heebeejeebies and I couldn't wait to leave. It reflected quite clearly so much of what is hypocritical and crass in the America today. 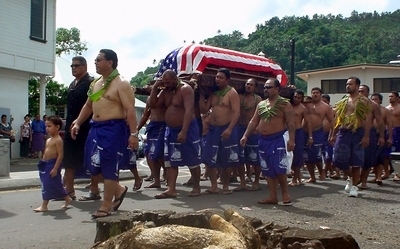 A high-profile funeral honored a recently deceased local VIP. where everyone has a chance at the "good things" in modern life. a hugely welcome breath of fresh air! and open-sided falles (dwellings) like these below for family living. protected lagoon for a nice swim. Chrissi says HI! 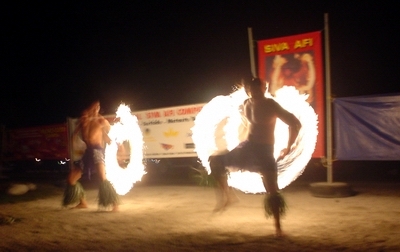 Fire dancing is a favorite fun thing from Samoa's history. 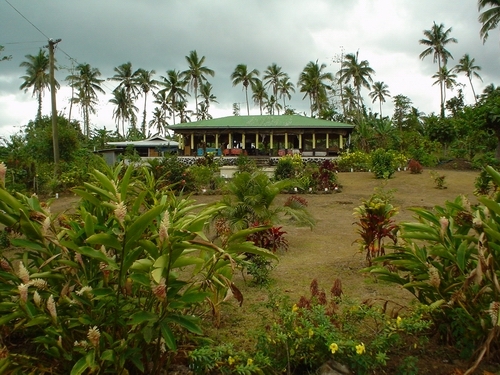 Robert Louis Stevenson loved Samoa and spent the last years of his life here. real and often bloody traditions from the times before the missionaries. in today's Samoa. There are churches everywhere and of many denominations. political power everywhere in the world.